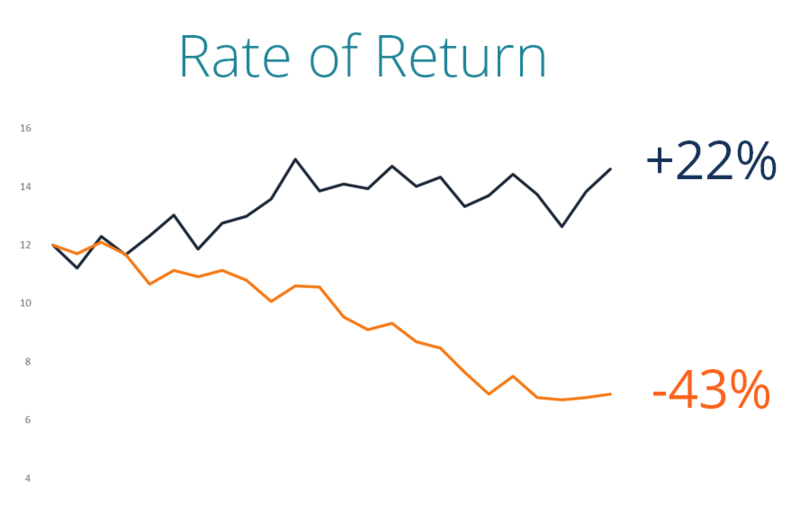 A Rate of Return (ROR) is the gain or loss of an investment over a certain period of time. In other words, the rate of return is the gainCapital Gains YieldCapital gains yield (CGY) is the price appreciation on an investment or a security expressed as a percentage. Because the calculation of Capital Gain Yield involves the market price of a security over time, it can be used to analyze the fluctuation in the market price of a security. See calculation and example (or loss) compared to the cost of an initial investment, typically expressed in the form of a percentage. When the ROR is positive, it is considered a gain and when the ROR is negative, it reflects a loss on the investment. Adam is a retail investor and decides to purchase 10 shares of Company A at a per unit price of $20. Adam holds onto shares of Company A for 2 years. In that time frame, Company A paid yearly dividends of $1 per share. After holding them for 2 years, Adam decides to sell all 10 shares of Company A at an ex-dividend price of $25. Adam would like to determine the rate of return during the two years he owned the shares. Therefore, Adam realized a 35% return on his shares over the two-year period. Note that the regular rate of return describes the gain or loss, expressed in a percentage, of an investment over an arbitrary time period. The annualized ROR, also known as the Compound Annual Growth Rate (CAGR)CAGRCAGR stands for the Compound Annual Growth Rate. It is a measure of an investment’s annual growth rate over time. with the effect of compounding taken into account. It is often used to measure and compare the past performance of investments, or to project their expected future returns., is the return of an investment over each year. Similar to the simple rate of return, any gains made during the holding period of this investment should be included in the formula. Therefore, Adam made an annualized return of 16.1895% on his investment. Return can mean different things to different people, and it’s important to know the context of the situation to understand what they mean. In addition to the above methods for measuring returns, there several other types of formulas.